Welcome to the 16th Anniversary of the USSSA Wilson DeMarini Elite World Series and welcome to the brand new, ultramodern, state-of-the-art, USSSA Space Coast Complex in beautiful Viera, FL. Year in and year out, the USSSA Wilson DeMarini Elite World Series has been the “Who’s Who of Travel Baseball”! If you truly want to see how your team stacks up against the absolute toughest competition in the baseball world at the zenith of all sporting venues, this is the ONLY event for you. Given the long standing history of this event as the “Grand Daddy of Them All”, it’s easy to see why people say, hands downs, the Elite is the pinnacle event for which all other travel baseball championships are measured!!! The USSSA Space Coast Complex is a short 25 minutes from the Kennedy Space Center, 10 minutes from the world famous Brevard Zoo, 15 minutes from the sugar white beaches of the Florida Coast, 45 minutes from Orlando International Airport, and 55 minutes from Disney. TEAMS SHOULD ARRIVE IN THE VIERA AREA NO LATER THAN 10:00 AM (EDT) ON MONDAY, JULY 8, 2019. All teams must Officially Register and Check-in on Monday, July 8, 2019. Each team will be assigned a specific registration time by age division from 12:00 PM to 1:45 PM (EDT) at the USSSA Space Coast Complex Clubhouse (5600 Stadium Pkwy., Melbourne/Viera, FL). Registration and Check-in are for Team Managers and one (1) additional Coach ONLY per team (players do not attend Registration and Check-in). A minimum of one (1) representative from each team MUST be present for Registration and Check-in. Please have all copies of Birth Records, USSSA Space Coast Complex Waivers, etc. in alphabetical order as they appear on your USSSA Official Online Roster. Your USSSA Wilson DeMarini Elite World Series roster must be entered online at www.usssa.com. This roster must be the same as the roster used when your team qualified for the USSSA Wilson DeMarini Elite World Series plus any allowable changes pursuant to USSSA Rule 3.08. The Deadline for roster additions/changes is 12:00 PM (NOON – EDT), Sunday, July 7, 2019. USSSA Rule 3.09 “Special Additions” ONLY will be added at Registration & Check-In by USSSA Staff. The venue for the USSSA Wilson DeMarini Elite World Series is the USSSA Space Coast Complex in Viera, FL (5800 Stadium Parkway, Melbourne, FL). 5 Game Guarantee! The Wilson DeMarini Elite World Series is a 5 Game Guarantee with teams playing Pool Play & Bracket Play. Teams MUST participate in their home state’s State Championship Tournament (provided such tournament is played) to validate their berth and participate in the USSSA Wilson DeMarini Elite World Series. There will be a Managers Meeting Monday, July 8, 2019, from 2:30 PM to 3:30 PM (EDT) at the USSSA Space Coast Complex Clubhouse (5600 Stadium Pkwy., Melbourne/Viera, FL). It is MANDATORY that one representative from each team attend. This meeting is limited to a maximum of two (2) representatives per team. Game schedules WILL NOT be released prior to the Managers Meeting so attendance is imperative. The Opening Ceremony is Monday, July 8, 2019 at the USSSA Space Coast Complex Stadium. Gates will open at 5:00 PM (EDT). Athlete line-up begins at 5:30 PM (EDT) with the Parade of Athletes starting promptly at 6:00 PM (EDT). More information will follow at the Managers Meeting. 8U KP $695 Entry Fee payable by credit card ONLY must be submitted to the USSSA National Office before the deadline of July 1, 2019. USSSA has established Approved ELITE Host Properties for this event. Upon receipt of your Commitment Form and Entry Fee, the complete list of Approved ELITE Host Properties with contact information will be sent to your Team Contact. The USSSA Space Coast Complex is a stay to play venue. These properties will not accept your reservation until the USSSA National Office has received your Commitment Form and Entry Fee. Rooms must be booked at the host property under USSSA/TEAM NAME. For additional details email stephanie.taylor@usssa.com. ALL PLAYERS and COACHES MUST SIGN the USSSA Space Coast Complex Waiver Form. You can find the Waiver Form at www.usssa.com, baseball home page (usually available by Jan 1st). Please bring the completed and signed Waiver Forms to Registration and Check-in. Having the Waiver Forms filled out in advance will streamline your team’s Registration and Check-in process. Player credentials (Entry Passes) are issued based on your team’s roster and completed Waiver Forms. Teams are limited to four (4) Manager/Coach credentials. There will be no additional credentials issued. LOE’s must be purchased either online or at the box office at the USSSA Space Coast Complex. USSSA has set up discounted area attractions tickets for USSSA Wilson DeMarini Elite World Series families. Each team is required to submit JPG or PDF format digital team photo and roster information for the USSSA Wilson DeMarini Elite World Series Event Program. An email with details of how to submit will follow once we receive your Commitment Form & Entry Fee. Upon receipt and processing of your team’s Completed Commitment Form & Entry Fee, the Team Manager (or Team Contact) shall begin receiving Email Updates pertaining to the USSSA Wilson DeMarini Elite World Series. If the Team Manager (or Team Contact) does not receive communication from the USSSA National Office within ten (10) business days from submitting your Completed Commitment Form & Entry Fee, please email jacki.algire@usssa.com or stephanie.taylor@usssa.com . It is the responsibility of the Team Manager (or Team Contact) to receive all information regarding the USSSA Wilson DeMarini Elite World Series. Exact dates and times may vary. Some divisions may start Bracket Play, Semi-Final Games or Championship Games a day earlier or later than others depending on team quantity. For inquiries pertaining to Official Online Rosters (including adds / changes), Managers Meeting, Athletes Ceremony, Official Commitment Form & Entry Fee, ESPN Wide World of Sports Waiver Forms and all other general questions, please email jacki.algire@usssa.com. For inquiries pertaining to Registration and Check-in, Housing / Accommodations, Team Photos for the USSSA Wilson DeMarini Elite World Series Event Program, please email stephanie.taylor@usssa.com. 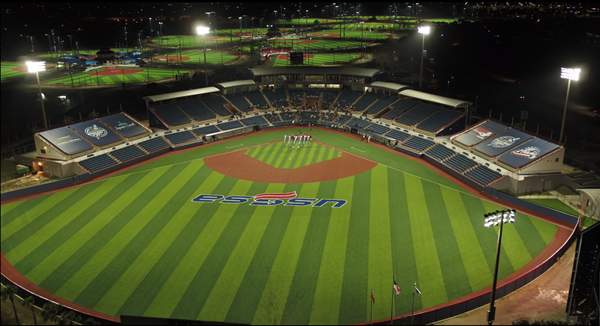 For inquiries pertaining to Event Format, Rules of Play and all aspects of “On Field Between The Lines Play” for the USSSA Wilson DeMarini Elite World Series, please email elite.director@usssa.com.